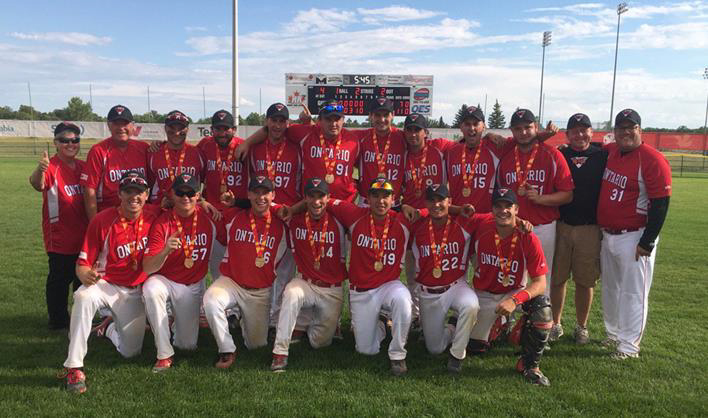 After a 12 year absence from the Canada Summer Games, Men’s Softball was back! Back Row Left to Right Paddy Fitzgerald –Nolan Team Leader and Manager, George Ryder Head Coach, Isaiah Whetstone, Liam LaForest, Jake Wiffen, Jeff St. Pierre, Matt Wardrop, Conner Weishar, Jared Weishar, Clayton Robinson, Mike Crawford Pitching Coach, Scott Searle Hitting Coach. 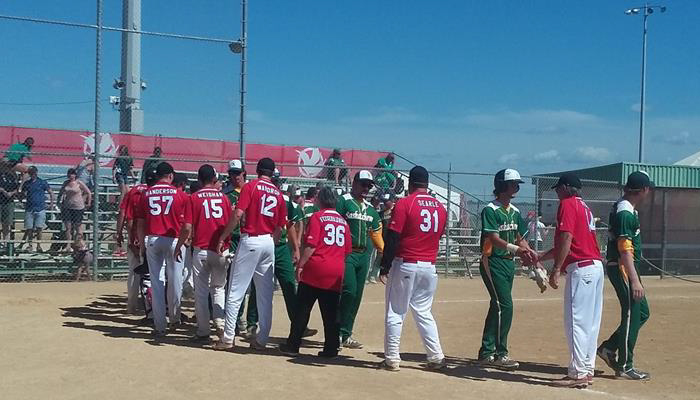 In one of the day’s best matchups, Saskatchewan used a five run third inning and held off a late rally by Ontario for the 6-4 win. Saskatchewan opened by scoring a run on a sacrifice fly in the bottom of the first. In the third inning, Justin Laskowski added a run to Saskatchewan’s lead with an RBI single, later followed by a two-run triple by Jordan Hudson and a two-run single by Reid Dubkowski as they built a 6-0 lead. Ontario’s offence got going in the top half of the sixth when Josh McGuire and Quinten Bruce hit back-to-back RBI doubles, with Jake Wiffen driving in a run with a single to cut the lead in half. Ontario added a run on an RBI single by Derek Elliott in the seventh but that was as close as they would get as Hudson closed out the complete game win, scattering four runs on 11 hits and striking out three. Team Ontario starting pitcher Clayton Robinson took the loss. In one of the day’s best matchups, Saskatchewan used a five run third inning and held off a late rally by Ontario for the 6-4 win. Saskatchewan opened by scoring a run on a sacrifice fly in the bottom of the first. In the third inning, Justin Laskowski added a run to Saskatchewan’s lead with an RBI single, later followed by a two-run triple by Jordan Hudson and a two-run single by Reid Dubkowski as they built a 6-0 lead. Ontario’s offence got going in the top half of the sixth when Josh McGuire and Quinten Bruce hit back-to-back RBI doubles, with Jake Wiffen driving in a run with a single to cut the lead in half. Ontario added a run on an RBI single by Derek Elliott in the seventh but that was as close as they would get as Hudson closed out the complete game win, scattering four runs on 11 hits and striking out three. Team Ontario starting pitcher Clayton Robinson took the loss. Team Ontario bounced back from a tough loss to Saskatchewan to start the tournament by trouncing Alberta 14-0 by using the long ball. Ontario pitcher Tyler Randerson saw his first action of the tournament and fired a four-inning no-hitter, striking out seven batters without allowing anyone to reach base. Jake Wiffen set the tone for the game right away by leading off the game with a solo homerun, with Jeff St. Pierre adding an RBI single and Randerson delivering a two-run double as Ontario took a quick 4-0 lead. Liam Laforest led off the second with a homerun of his own, later followed by a two-run shot by Dennis Benson and three-run blasts by both Randerson and Wiffen. Benson added a solo homerun to start the third inning to round out the scoring. Matt Wardrop led Ontario in the pitcher’s circle and at the plate by firing a four-inning one-hitter, and going 3-for-3 at the plate with a homerun and five runs batted in. Wardrop hit a two-run single in the top of the first inning, with Ontario adding a run on a bases loaded walk and a sacrifice fly for the early 4-0 lead. The following inning, Wardrop hit a two-run shot to increase the lead to 6-0. Jake Wiffen and Quinten Bruce each hit two-run singles in the third, along with RBI singles by Wardrop, Josh McGuire and Jared Weishar along with an RBI ground out to make the score 14-0. In the fourth, Ontario added five runs on six hits. Nick Butler got New Brunswick’s only hit in the bottom of the fourth. Jody Rice started the game in the pitcher’s circle for New Brunswick and registered the loss. 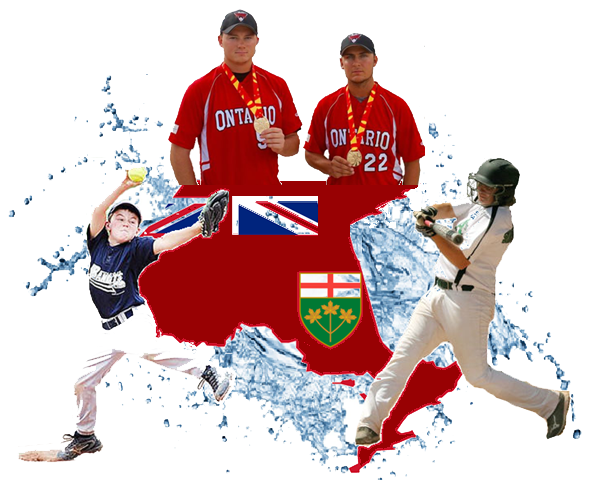 In one of the tournament’s most important matchups to date, Quebec came out on top on a solid pitching performance by Kirk Santala and held off a late rally by Ontario. Team Quebec jumped out to an early lead with a run in the top of the first on an RBI groundout, and added two more in the second on a run-scoring double by Marc-Antoine Demers and a fielder’s choice to take a 3-0 lead. Ontario got one run back in the bottom of the second on an error, but Quebec later added its fourth run in the fourth inning on an RBI single by Brandon Lemay. Matt Wardrop drove in a run for Ontario in the fifth with a sacrifice fly and Dennis Benson got them within one with a solo homerun, but Quebec held them down in the bottom of the seventh to secure the win. Santala pitched the complete game win, allowing three runs (two earned) on seven hits, while Wardrop was saddled with the loss. In another important game in the chase for a playoff spot, Ontario built a lead and put the game away early in five innings to end Team PEI’s three-game winning streak. Isaiah Whetstone opened the scoring with a two-run homerun in the top of the second, while Dennis Benson connected for a three-run blast in the third to give Ontario a 5-0 lead. Matt Lange hit a solo shot for PEI in the bottom of the inning, but Ontario got that run back with a sacrifice fly in the fourth. Team PEI reduced the lead to 6-3 in the bottom of the frame on an RBI triple by Sam Walsh and a run-scoring single by Ty McAdam. Ontario went on to put the game out of reach by scoring five runs in the fifth, as Benson connected with an RBI double, Whetstone hit a two-run single and two more runs scored on an error and a groundout. Lange hit another solo homerun in the bottom of the fifth for PEI but it wasn’t enough to extend the game as Ontario won on the run-rule. Jeff St. Pierre picked up the win in the pitcher’s circle for Ontario, while Jonathan Arsenault suffered the loss. while Muswaggon was tagged with the loss. 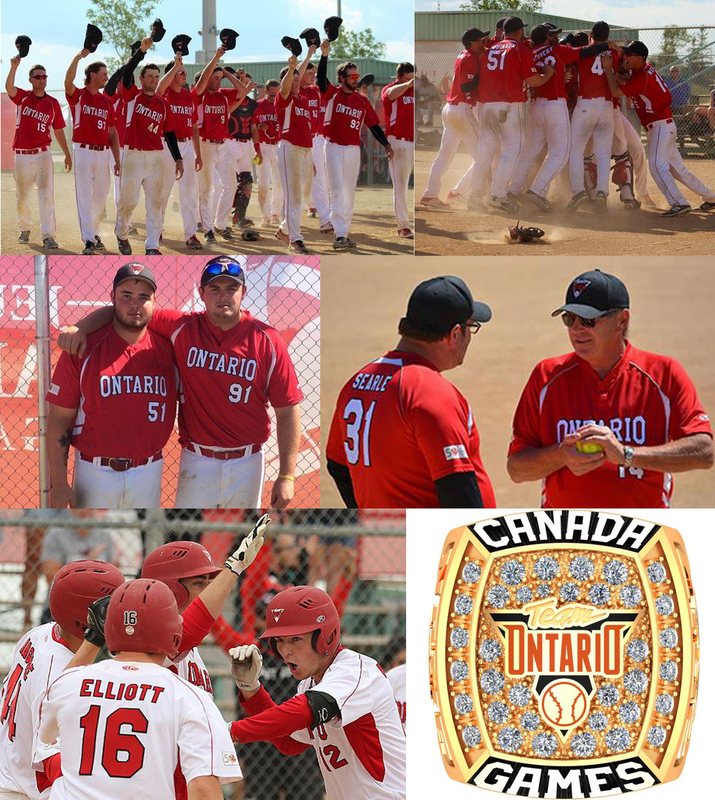 Ontario won an important game against Newfoundland & Labrador to position themselves very well in playoff contention. Newfoundland & Labrador opened the scoring with two runs in the bottom of the first on a two-run homerun by Nic Pittman. However, Derek Elliott hit a solo homerun the following inning for Ontario with an RBI single by Jake Wiffen later in the frame knotting the score at 2-2. In the third, Tyler Randerson hit an RBI single, Connor Weishar hit a two-run single and Elliott scored on a sacrifice fly as Ontario went ahead 6-2. The score remained the same until Team Ontario added four more runs in the top of the sixth, scoring the first on an error, two on a double by Josh McGuire and another on a groundout. Randerson registered the six-inning win for Ontario while Eric Healey was saddled with the loss. Team Ontario picked up their second win of the day as Matt Wardrop held Alberta to only two hits in the five-inning game. Nick Penner opened the scoring with a two-run single in the top of the second for Ontario, with another run scoring on a sacrifice fly. The following inning, Derek Elliott launched a two-run homerun to increase the lead to 5-0. Liam Laforest added a two-run shot of his own in the fourth and Team Ontario got two more runs on a single by Isaiah Whetstone and an error. Alberta’s run came in the bottom of the frame on a single by Brody Rosychuk. Dennis Benson drove in a run with a single in the fifth. Cody Domoney was the losing pitcher for Alberta. In the day’s feature game, Ontario defeated Nova Scotia to create a three-way tie for second place in the standings, with Ontario earning second spot. Nova Scotia opened the scoring with RBI singles by Alex Anthony and Noah Hawes in the top of the second, but Ontario came back right away with a three-run blast by Matt Wardrop and a solo shot by Jake Wiffen to take a 4-2 lead. Dennis Benson added a two-run homerun in the fourth, and Ontario added three more in the bottom of the sixth on a passed ball, an RBI single by Benson and a run-scoring double by Quinten Bruce to end the game on the run rule. Wardrop got the win with Anthony taking his first loss of the tournament. In the playoff matchup between the two top teams from the preliminary round, Ontario got on the board quickly with a run on a single by Isaiah Whetstone, scored another on a passed ball in the second and tacked on three in the third on a three-run homerun by Josh McGuire to build a 5-0 lead. Sheldon Beierle drove in a run with a single for Saskatchewan in the bottom of the inning, and the score remained the same until the top of the seventh. Jeff St. Pierre and Jake Wiffen each hit RBI singles, Derek Elliott smacked a two-run double, with two more runs coming on a passed ball and a fielder’s choice. Tyler Randerson pitched the complete-game win, while Jordan Hudson suffered the loss.